In Japan, viewing cherry blossoms as you enjoy food and drinks is called "HANAMI". As they look very beautiful when their pink flowers are in full bloom, cherry blossoms have been loved by Japanese people since ancient times. Cherry blossoms start to appear from late March to early April depending on the temperature, and fall approximately two weeks after they bloom. If you come to Japan during the cherry blossom season, why not enjoy this beautiful festival which is only held once a year! Cherry trees line both sides of the road along the river. When in full bloom, the cherry blossoms create a tunnel of flowers, so you can enjoy them out of the car window as you drive through them. Approx. 15-minute bus ride from the Kintetsu Yatomi Station. Get off at Izumi Jinja. Approx. 15-minute drive after leaving the Higashi Meihan Jidoshado Highway at Yatomi IC. Free parking available for 5 cars. A Japanese-style park created at the site of Kuwana Castle. The park will be illuminated from sunset to 9:30pm during the cherry blossom festival period. Enjoy the scenic beauty of Japan evoked by the cherry blossoms and the park. Approx. 10-minute bus ride from the JR/Kintetsu Kuwana Station. Get off at Honmachi. Paid parking is available for 65 cars. 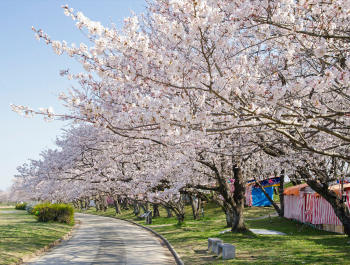 *The parking lot within the park is not available during the cherry blossom festival period (April 1 to 15). A multipurpose bathroom provided with a sink for ostomates available. This site is only open to the public on Saturdays and Sundays, depending on the blooming period each year. Highly recommended to those interested in the Japan Ground Self-Defense Force. Five-minute walk from Kintetsu Hisai Station. Approx. 10-minute drive after leaving the Ise Jidoshado Highway at Hisai IC. Designated as a Place of Scenic Beauty in Japan and chosen as one of the “100 best Sakura viewing points in Japan” by the Nihon Sakura no Kai (Japan Cherry Blossom Association), this site attracts a large number of tourists each year. Approx. 10-minute bus ride from the JR Ise Okutsu Station. Get off at Sugihira. Approx. 1-hour drive after leaving the Ise Jidoshado Highway at Hisai IC. Free parking available for 150 cars. You can enjoy food and drink at the various stalls set up in the park during the spring festival period. The park will be illuminated from 18:00 to 21:30 in the evening. Approx. 10-minute walk from the west exit of the JR/Kintetsu Tsu Station. Approx. 10-minute drive after leaving the Ise Jidoshado Highway at Tsu IC. Free parking available for 50 cars. * Free temporary parking is available during the spring festival period. The view of 1,500 cherry trees' blossoms reflected on the surface of the dam is spectacular. You can enjoy local dishes at restaurants around the dam while viewing cherry blossoms. Approx. 5-minute bus ride from the JR Meisho Line Ise Takehara Station. Get off at Kimigano Dam Koen. Approx. 40-minute drive after leaving the Ise Jidoshado Highway at Hisai IC. An abundance of cherry blossoms bloom around Ueno Castle, which boasts the highest moat walls in Japan. Together with the Ninja Museum located in the park, the castle, ninja and cherry blossoms combine to show you the kind of Japan you see in the movies. Approx. 3-minute walk from the Iga Line Ueno-shi Station. Approx. 5-minute drive after leaving the Meihan Highway at Ueno Higashi IC or Nakase IC. Paid parking is available for 500 cars (500 yen). Cherry trees line the river that runs through the sacred area of the Ise Jingu Shrine, so you can enjoy the blossoms when visiting the shrine in spring. There are many restaurants and gift shops and a wheelchair-accessible bathroom nearby that offers comfort to wheelchair users. Approx. 15-minute bus ride from the JR/Kintetsu Ise-shi Station. Five-minute walk after getting off at Jingu Kaikan Mae. Approx. 5-minute drive after leaving the Ise Jidoshado Highway at Ise IC. This site was chosen as one of the “100 best Sakura viewing points in Japan” by the Japan Cherry Blossom Association. You can enjoy a festival atmosphere when visiting the river bank illuminated in the evening, lined with food stalls and decorated with paper lanterns. Miyagawa is highly recommended as a cherry blossom viewing spot in and around Ise. Approx. 7-minute bus ride from the JR/Kintetsu Ise-shi Station. Get off at Wataraibashi. Free parking available for 200 cars. 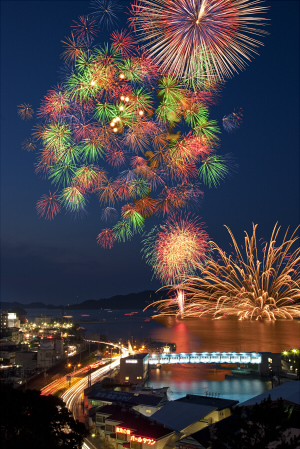 When summer arrives, fireworks displays are held all across Japan. Fireworks in various sizes and forms appear like flaring flowers blooming in the dark night sky. This is why the Japanese word for firework includes the meaning of "hana or flower". In recent years, New Year's Eve has been celebrated in many countries with fireworks synced to the midnight countdown, whereas in Japan people have always enjoyed fireworks as a summer tradition. People often enjoy fireworks displays dressed in yukata (summer kimono), which you rarely see worn on the street. 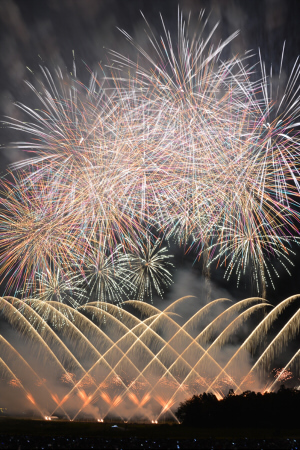 A fireworks competition in which excellent pyrotechnicians selected from across Japan compete over their skills. It is said to be one of the three greatest fireworks events in Japan. Approx. 15-minute drive on Prefectural Highway 37 after leaving the Ise Jidoshado Highway at Ise Nishi IC heading for Geku, in the vicinity of Wataraibashi. Using public transport is recommended, as traffic is expected to be busy near the site. You can enjoy fireworks by the sea that are thrown into the water from ships sailing very fast, and exciting fireworks launched from ships sailing as close to the spectators as possible. Shuttle bus service is available from the east exit of the JR/Kintetsu Tsu Station, and the parking (for 1,300 cars) of Mie-ken Sangyo Shien Center (Messe Wing Mie), which can be accessed by leaving the Ise Jidoshado Highway at Tsu IC. Fifteen-minute walk from the Tsu Kyoteijo (Tsu Speedboat Racecourse) parking lot (for 3,000 cars) located along the Route 23. 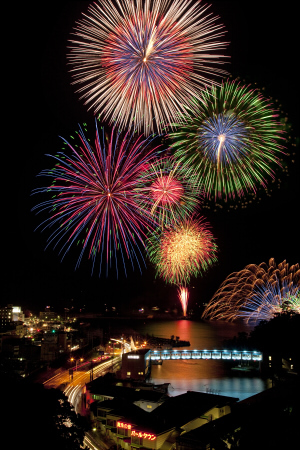 Fireworks are launched from ships in this fireworks festival by the sea. You can enjoy the fantastic reflection of the fireworks on the surface of the water. You can also enjoy some typical features of Japanese festivals such as Japanese drum performances and food stalls. Eight-minute walk from the JR/Kintetsu Toba Station. Seven-minute walk from the Toba Bus Center. Approx. ten-kilometer drive via the Ise Futami Toba Line after leaving the Ise Jidoshado Highway at Ise IC. Paid parking is available for about 500 cars. *The parking may fill up early. Fireworks are launched form a sandbar of the Ibi River. 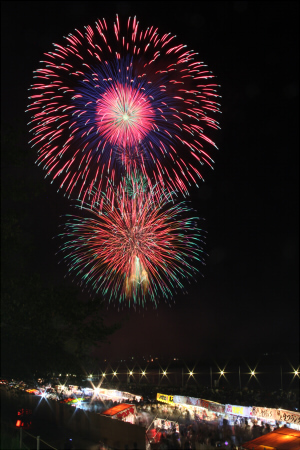 One of the largest fireworks in the Tokai District will be launched in the climax of the display. Twenty-minute walk from the JR/Kintetsu/Yoro Railway Kuwana Station. Both free and paid parking are available. Using public transport is recommended, as traffic is expected to be busy near the site . The last firework is launched synced to the countdown that all the spectators participate in, making everyone feel part of the exciting event. Approx. 30-minute drive after leaving the Meihan Highway at Ueno or Hari IC. Held on Saturdays and Sundays in August. You can enjoy the spectacular fireworks display up-close around the amusement park's lawn area. Approx. 15-minute drive after leaving the Higashi Meiham Jidoshao Highway at Nagashima IC. Lit fireworks are thrown into the sea from ships sailing at full speed. The reflection of the sound on the rocks and resonance in the caves are stunning. Citizen-sponsored fireworks commemorating birthdays, wedding anniversaries etc. launched with your messages are popular.